Put simply, the squad is not good enough to cut the mustard in League Two. Furthermore it seems plain that they recognise their weaknesses and the coaches do not have the experience to help the players surmount those shortcomings. Some around me expressed the opinion that Gabriele Cioffi would not keep his job until the end of the season and, more worryingly, others hoped that would be the case. It can’t be denied that Lincoln City’s quality was such that their win was fully deserved but our team’s shortage of ideas and the lack of fight shown by some of them confirmed that the club needs a stronger hand on the tiller. 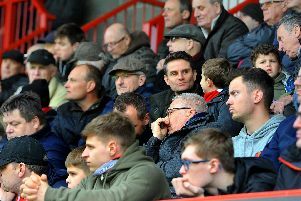 Picture gallery: Were you in the crowd to watch Crawley Town take on Lincoln City? Ollie Palmer came in for a lot of criticism for his failure to mix it with the visitors’ defenders, or even to show much enthusiasm at all, and he did not follow the lead of the never-say-die Reece Grego-Cox or the buccaneering Panutche Camara. Don’t get me wrong this result was not simply down to Palmer’s lack of aggression as several of his team-mates played as though they realised they were second best rather than trying to disprove the doubters. Needless to say Dannie Bulman’s display did not merit such criticism. Some things never change though. Crawley were holding their own when Bruno Andrade whipped in a superlative angled volley from Neil Eardley’s perfect short cross. Shay McCartan was granted the freedom of Broadfield as he waltzed through the faint hearted defence to score the second before Cian Bolger was left completely unmarked when he nodded in the third. We again saw some bizarre decision-making from the referee although fortunately there were no game-changing mistakes like the missed handball at Crewe that set us on the slippery slope. Lincoln always played comfortably within themselves as they were never tested and needed only four attempts (all on target) to notch three goals and three points. You don’t mind being beaten by a better side as long as you have given a good account of yourselves. It was that last bit we didn’t manage. Once again other results were not damaging to our survival hopes but we can’t rely on that continuing. I believe we will still be in League Two next season but this one has been thrown away after a promising start. Somebody should be held accountable for the game plan that seems to deter our attacking players from trying to score. This could be why when scoring opportunities do arise the Reds are so poor at taking them. The prospects from Lincoln’s visit boosted the home gate but the side’s meek acquiescence won’t encourage many to come back.